This little Eddie Elf doll was a joy to create!!. I chose a bright array of felt fabrics for his removeable clothing. Trying very hard to match the “original” doll, from pictures in a variety of Raggedy Collectors books. Compare him to the picture of the original doll that is pictured below! however, the rest of his seams I have hidden inside……….for a more “finished” look! Notice his facial features………….I think you will agree……..
they are very close to the original doll. 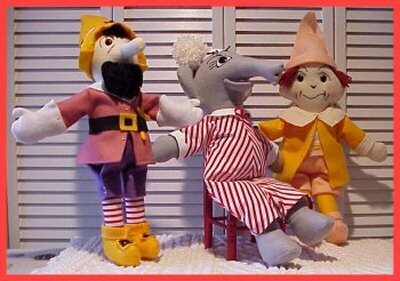 The original doll was approximately 15” without his hat……..
mine like my other Raggedy Character collectible dolls is approximately “20” (Soon all characters will be available in 10" & 15") . He will surely be the center of attention in your Raggedy collection. 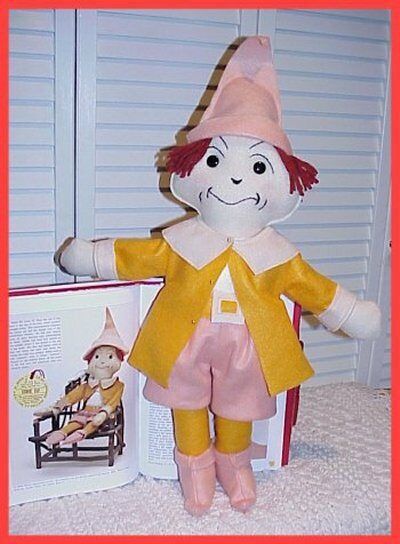 His balloon pants and little elf hat and boots are peach toned felt. he wears a goldenrod felt belt with off-white felt buckle to complete his ensemble. I have used gold-toned tiny studs to match those used to trim the original doll’s clothes. maybe one day you will be lucky enough to find an “ORIGINAL” to take his place!!. I have tried very hard to duplicate the original. 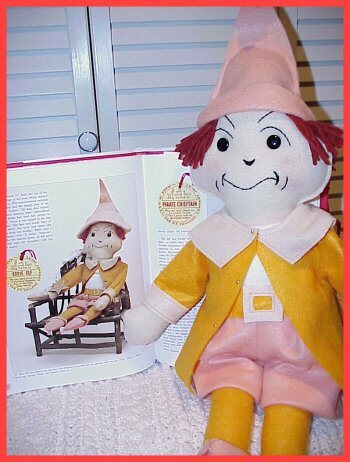 This delightful little "Character" doll is patiently waiting for someone to take him home and love him!! so that you can see how well they compliment each other!! WHY NOT COLLECT THEM ALL???? Be sure to visit each character's individual page. I have also tried to give the name of the Johnny Gruelle storybook(s) you will find them in. 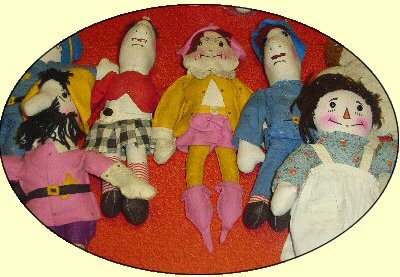 You will also find out if there were "original" dolls made, and who they were manufactured by.